Santiago Castro Mira (1994), from Medellin, Colombia. Is currently studying Bachelor of Fine Arts at The Universidad de Antioquia. His work starts from his interest in the human face, the features and individuality that It offers. He sees the face as the literal and fundamental base of identity and the primary way to Access to the sensibility of each person. He is currently focusing on portraiture and the use of color and stain, giving a expressionist touch to his artwork. He mainly uses Acrylics and watercolor. 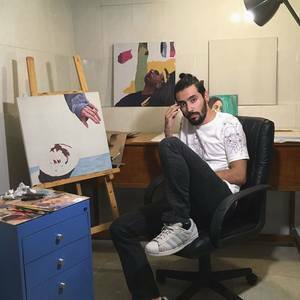 Most of his paintings are shared via instagram, where His account has currently +20.000 followers. 2016-(currently studying) BFA in Fine Arts from University of Antioquia. 2015. Oil painting course from Bellas Artes Academy. 2015 DIBUJO Y ÓLEO Palacio de Bellas Artes, Medellín, Colombia. 2017 SEGUNDO SALÓN DE ARTES FRANCISCO MORALES, Caldas, Colombia. 2018 IDEABORN INTERNATIONAL FINE ARTS CONTEST, Barcelona, España.